When you look for sunscreen without palm oil, you typically won’t see ‘palm oil’ in the ingredients. Most are in the form of palm oil derivatives. Sunscreen lotions, creams, balms and sprays typically contain palm oil in some form. 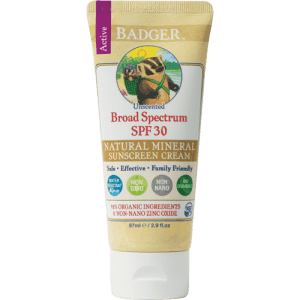 We’ve confirmed with these companies these sunscreens are palm oil free. They have confirmed all of their products, including their sunscreens, are palm oil free. These are available in Original or Extra Protection. 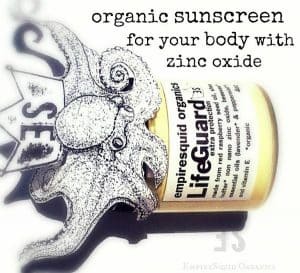 They contain zinc oxide. 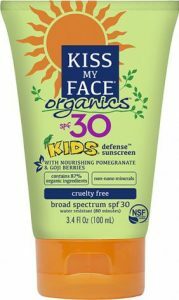 The Vitamin E in these sunscreens are palm oil free and made with non-GMO soy and sunflower oil. 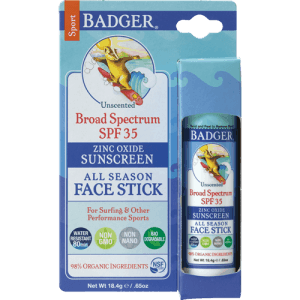 They have confirmed these sunscreens are free from palm oil derivatives. They have confirmed they make these two sunscreens without palm oil. It’s a good idea to wear sunscreen in the summer, on vacations, and when you will be outside for awhile. More people use sunscreen on sunny days in the spring and fall as well. It’s really important to read labels for sunscreen. We have searched most every commercial brand, and they all contained some type of palm oil derivative. Oftentimes, they contained more than one. Watch out for industry buzzwords. Many companies who tout “plant-derived,” “natural”, “vegan”, and “organic” may still be using palm oil derivatives in their sunscreens. Please support these sunscreens without palm oil. Read labels. Learn how companies use palm oil so you know what to watch for. There are hundreds of names for palm oil derivatives. Remember to read labels as companies change ingredients. This list is meant to be a starting point as a reference to help find sunscreen without palm oil. Let us know why you choose sunscreen without palm oil. 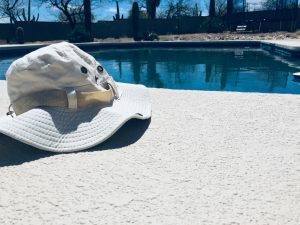 If you know of palm free sunscreens, please list them in the Comments.